My Wandering Life: How many Lego? One of Nathan's Star of the Week activities is to bring in a bunch of something and then let the class guess how many you brought. 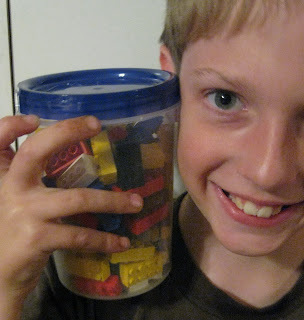 Nathan is bringing a jar of Lego. Can you guess how many there are? The jar is filled to just under the 4-cup mark, and all the Lego are the same size. If you get it right you can have... an extra 20 minute recess! Hey, I'm feeling generous... if you participate at all, you can take the extra recess! I'm guessing 61. I hope I win :). My guess was 75 (before I was told how many).